Systematization is standardizing a sequence of events through automation or verifiable reaction protocols designed to produce consistent outcomes. It's also where the rubber hits the road for the Percent Perfect Methodology® (PPM), which is designed to achieve rapid and sustained results in operating efficiency and manufacturing profitability. We see systematization everywhere we look, especially in manufacturing. For example, every factory has a system for tracking and managing when and how much an employee should get paid based on the hours they worked each payment cycle. If an employee wants to take a day off or works an extra shift, there are usually well defined protocols in place to make sure that employee is compensated accordingly. The reason just about every company has gotten this particular process down to such a science is because failing to fairly compensate employees could land them in some serious hot water. In this case, the motivation is fear of a lawsuit or disenfranchising workers; it's also just outright unprofessional when people aren't getting paid on time and in full. Systematize is the fourth and final phase of the PPM. In Phase 1, we defined perfection for your manufacturing operation. Phase 2 assessed where exactly you are in your journey to Operational Perfection (OP). In Phase 3, we prioritized 3 - 5 critical initiatives needed to make substantial progress toward your potential. In Phase 4, Systematize, we look closely at how to fully integrate the 3 - 5 critical initiatives identified in Phase 3 into your operating model, or the way you do business, to close the gap between your current state and OP. This produces rapid results and ensures that improvements are sustained. - An event or trigger to indicate that waste has occurred. - A method or technique for making the waste or inefficiency visible and/or highly detectable. - A reaction protocol - This could be an automatic or manual series of steps to be taken to remediate and eliminate the opportunity of re-occurrence of waste. - A method or technique to track, quantify, and report waste events and their impact on operating cost and service levels. There also needs to be a way to evaluate the quality of response from element 3. - A method or technique for allocating the appropriate resources to minimize or eliminate chronic process waste - This is to continuously improve processes where the greatest ongoing opportunities exist. An overwhelming majority of Continuous Improvement initiatives fail to sustain because the organization gradually (and sometimes instantly) rejects the changes needed to make progress. For example, I've seen organizations do kaizen events to reduce changeover times (called SMED events) but fail to systematize the initiative to see and effectively respond when there is a deviation from the new procedure - and thus waste is allowed to creep back into the process. In other words, the organization rejects the initiative. If this backsliding were to happen with the payroll system and people were not being paid on time and in full, the reaction would be swift and possibly quite extreme. For this SMED event to sustain, there should have been techniques installed to ensure that the new process was being executed as specified and detailed reaction protocols to address any deviation from standard. One tool for achieving this would be something like a changeover clock that alarms or sends an alert if the allotted timeframe is exceeded, indicating that waste is occurring. Then the alarm or alert triggers waste elimination protocols. Generally speaking, lights and sounds are great tools for highlighting that waste is occurring. These are called andon systems. Poka Yoke - If waste could be eliminated automatically then it should. The tool for this is called poka yoke, or error-proofing. This is a technique for preventing or limiting any activity that produces waste. It is also the most effective tool to Systematize improvement. Examples are guides that ensure perfect assembly on the first attempt or an outlet designed to prevent the wrong device from being plugged in. 5S - Finally, 5S which stands for Sort, Set in order, Shine, Standardize, and Sustain can be used as a tool for making waste highly visible. 5S is a technique to organize a workstation to increase efficiency and make so that wasteful activity becomes visualized. For example, if cleaning tools are to be staged near the production line, an area should be designated for those cleaning tools. If the tools are not in use or in their designated space, waste is likely occurring because the line operator will end up needing to wait or walk to another workstation to get the supplies they need. Performance Reports - The purpose of performance reports is to highlight the amount of and other details about the waste that has occurred. The more real-time and actionable these reports are, the more waste can be eliminated from the process. This is ranked last on the list of Response tools because it's the least reactive method of eliminating waste. The interval between reports indicates the window that inefficiency is allowed to fester before it can be identified and addressed. For example, up to a week may go by before you become aware of an issue if you're using a weekly report. The rule of thumb for Performance Report effectiveness is visibility. The objective is to make waste very obvious and public, which has to do with how the report is formatted. It also has to do with how the report is presented. For example, huge boards or screens that highlight opportunities positioned in the main entrance where everyone can easily see are going to be a lot more effective than a report that gets saved on a hard drive and left there. The fOS at http://factoryoperatingsystem.com is a great tool for reporting performance since it automates the data synthesis and disseminates performance reports along with success stories to appropriate personnel within the operations chain of command. T=20 mins - Notify Plant Manager to engage necessary resources including but not limited to reaching out to other facilities for ideas and supportThis protocol would be executed until the issue is resolved. For example, if the issue is resolved after 10 minutes, the Operations and Plant Manager would never be engaged. However, the issue would still be presented in Performance Reports and followed up on to ensure absolute resolution. Day 0 - 1 = Line operators are given an opportunity to resolve the issue through Root Cause Analysis (RCA) or other CI tools. The Plant Manager is the last point of accountability for ensuring that the escalation protocols are being used and are working as expected. He or she should apply downward pressure to resolve issues before they reach the Plant Manager level. Again, this only applies to issues that do not use Automated Response tools; and thus is why the Automated Response tools are superior. At each phase in escalation, a specific person and due date needs to be assigned. There also needs to be a set of rewards / consequences for resolving or allowing issues to escalate. This set of rewards and consequences will vary by organization and company culture. Lastly, before items can be removed from the escalation process, there needs to be a method to ensure that the issue has been resolved effectively. In the Systematize phase of the Percent Perfect Methodology®, the 3 - 5 initiatives identified in the Prioritize phase are "systematized" into your operations model. 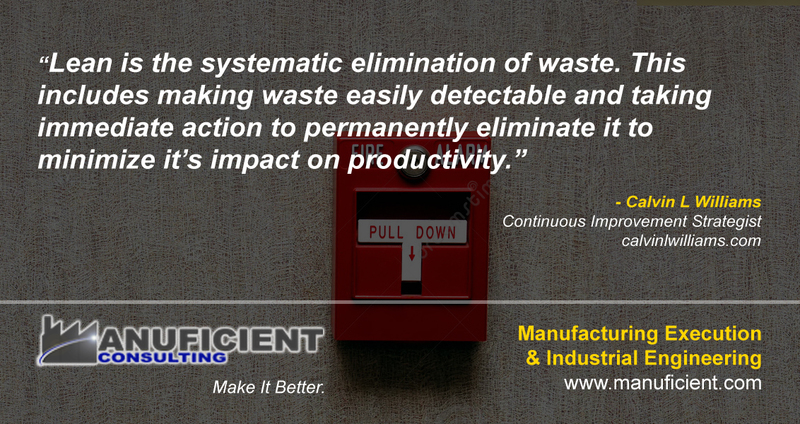 Automated waste identification / prevention and correction tools are deployed to reduce or eliminate inefficiency. Escalation protocols are also implemented to make sure that systemic process failures are effectively managed and eventually eliminated for key initiatives. This also includes training internal resources to see the waste and to develop proficiency in the tools that are best fit to eliminate it. The fOS gives you a good indication of where you are in your journey to Operational Perfection by team, product, production line and other factors. A Plant Manager should also be mindful of how many issues are being escalated to their level because this indicates how competent the management team is. A highly competent team would resolve more issues at lower levels and prevent escalation. Frequent escalations indicate that additional training is needed to increase operational discipline. A manufacturing efficiency expert such as those at Manuficient can help to systematize improvement initiatives and ensure sustainment of improvement efforts.